Behailu Shiferaw is communications specialist for WaterAid in the East Africa region. KIGALI, Rwanda, Jul 10 2018 (IPS) - To many of us, ‘keep out of the reach of children’ is a phrase we see printed on labels for medicines and chemicals. To mothers in Rweru Sector, Rwanda, it’s a daily principle to live by. “Once we collected the water, we wouldn’t just leave it anywhere until it is boiled and safe to drink. We always put it at a height the younger ones couldn’t reach. We feared they might accidentally drink it,” 50-year-old Mukakibibi Priscile told me. In the village, mothers like Mukakibibi could not afford to be complacent. A slip-up could have serious consequences. Only a few years ago, Mukakibibi’s neighbour and close friend, Zebuliya, lost her three-year-old child to diarrhoea, high fever and vomiting, all of which, the doctor told her, are directly linked to drinking unclean water. Three years later, the village is transformed now that its 6,000 people have access to clean water close to their homes. WaterAid Rwanda’s collaboration with DfID made it possible to dig two new boreholes in an area with proven underground water potential. Those two boreholes give a combined yield of 3.4 litres per second, which is enough for such a small village. A solar-powered pump that needs little maintenance and has zero running cost for the communities pumps the water into two 40,000 litre tanks, which is then used to supply the village, the school and the health centre with water. Rural households access the water through five water kiosks, one of which happened to fall right in front of Mukakibibi’s house. Mukakibibi could not be happier; instead of walking for an hour-and-a-half to get dirty water from the lake, she now needs only a few minutes to fetch clean water to cook, drink, or wash with. No longer does she need to hide the water from her grandson. The Nzangwa Health Centre in the village has also undergone a transformation; the head of the centre, Ndamyuwera Edison, told me he had not heard of any child who died of waterborne diseases over two years, since the villagers have access to clean water. In addition to a constant clean water supply, the health centre has also got a new waste burner, a placenta pit and a medical waste disposal chamber. The clinic also has a fully revamped and functioning block of showers and toilets. Ndamyuwera explained that before the health centre had a clean water supply, the janitors were so busy fetching water that none of the delivery rooms were cleaned in between births, at great risk of mothers and their babies. When I met one of the janitors, Eric, in 2016, he was barely around to do any cleaning work. Instead, he was constantly transporting water in jerry cans on his run-down bike. I once followed him on one of his water runs; when we got down to the lake – after a good 30 or 35-minute biking up and down a zig-zagging dirt road – he got off the bike, unstrapped the jerry cans, took off his sleepers, folded up the legs of his trousers and walked straight in. No dipping his toes first. When I saw him again now, after WaterAid had brought water into the health centre, I found Eric in blue overalls, rubber boots and safety gloves. He is a full-time janitor now. On one side of his bedroom in his house hangs one of his old jerry cans – covered and embellished in a fertiliser sack. In the middle is a hole out of which shows a speaker connected to his radio set. Eric crawled over his bed to connect two thin wires, and music filled the room. Now that is transformation – I thought. Across the world 844 million people still do not have access to clean water, and 1 in 3 people still live without adequate sanitation facilities. In Rwanda alone 43% of people live without basic access to water, while 38% of people do not have a decent toilet. Each year, over 900 children under 5 die from diarrhoea. World leaders have come together at the United Nations headquarters in New York for the High Level Political Forum (HLPF), 9 July-18 July, to review the progress that has been made on Sustainable Development Goal 6 (SDG 6) – to provide clean water and sanitation to everyone, everywhere. 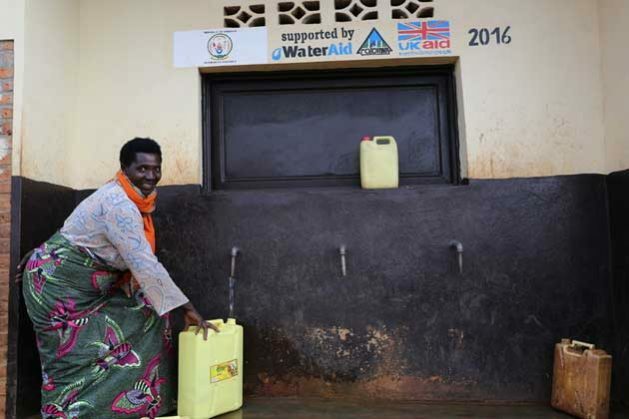 On current progress, Rwanda is on course to have universal access to clean water by 2082 and to give everyone access to a decent toilet by 2047. To achieve the transformation that Mukakibibi’s village has gone through all around Rwanda, efforts on health and nutrition need to be integrated with action on water and sanitation. Global goal 6 on water, sanitation and hygiene for all underpins progress towards the global goal on ending malnutrition and providing health for all.